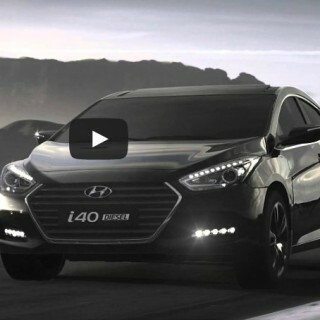 One of the hottest movies franchises of the past decade or so has been the Transformers, and that is what you think of when you see the promo video for the new Hyundai i40. As the old model drives along a deserted road in desert terrain, an alien craft zooms in and hovers overhead for a moment before enveloping the vehicle and creating the stylish all-new design. It’s an ad that sci-fi fans will enjoy, but that Hyundai fans will truly love. It’s a mid-cycle makeover for the Hyundai i40 and that delivers a new look inside and out. When the vehicle was released back in 2011, it was viewed as a solid rival to the leaders in the large saloon class. This new style will allow it to keep pace with newbies like the Ford Mondeo and VW Passat. The changes made to the i40 sedan and i40 Tourer are in line with those seen on the i30 hatchback facelift, which means a hexagonal grille, new alloy wheels, and paint. The interior gets a revised new look too, with updated materials and a better navigation system. DAB radio and LCD display will also be added across the range. The diesel engine options are kept to a minimum, with just two to choose from. The base 113-horsepower engine is essentially the same as before, although with improved fuel economy and CO2 emissions. The 1.7-liter CRDI versions gets a slight boost in power to 139-horsepower. There are some new safety features included as standard in the i40, such as Lane Keeping Assist, which has the added benefit of dipping the high beams automatically when traffic approaches. Also included is a Speed Limit Identification system that checks and displays posted speed limits. The new Hyundai i40 range is expected in the market in the early part of 2015, which is when full specs and pricing will be revealed. Stay tuned for more news about Hyundai Motor Company!